Donnielle Tyner has read 127 of 300 books. Donnielle Tyner read 392 books of her goal of 230! Donnielle Tyner read 325 books of her goal of 150! If you want to join my Nerd Herd and be informed of new releases Hello! 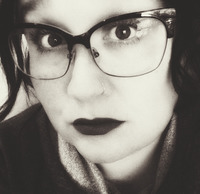 I’m Donnielle Tyner, writer of Science Fiction for young and new adults, reader of just about anything that catches my interests – mainly books with science fiction, paranormal/ fantasy, and romantic themes, and lover of science, tabletop games, anime, comic books, and crude humor. To ask Donnielle Tyner questions, please sign up. Hi Donnielle, glad to hear that you're reading my novel. I'm an indie author, and this is my first novel, so I'd love to hear what you think of the work. Your'e one of the first people to read it. Please let me know your thoughts. Do you have time to write a review? Donnielle Tyner I will review it both here and on Amazon once I am finished. Donnielle Tyner I'll quote my son on this one... *cough* "My friends have to wear pants when they go to school. Not me! I'm lucky. I never have to wear pants." Replace…moreI'll quote my son on this one... *cough* "My friends have to wear pants when they go to school. Not me! I'm lucky. I never have to wear pants." I have received quite a few emails regarding my boxed set and the second book in my Caelian Cycle Series, Bound. Apparently during my rush in getting updated versions out before my BookBub promotion and my fast encroaching deadlines for As We Rise: Rogue, I uploaded an older draft of Bound instead of the fully edited version. We’d love your help. Let us know what’s wrong with this preview of Smoke and Wishes by A.J. Macey. We’d love your help. Let us know what’s wrong with this preview of Chained by D.H. Sidebottom. We’d love your help. Let us know what’s wrong with this preview of Caged by D.H. Sidebottom. We’d love your help. Let us know what’s wrong with this preview of Sovereign by Celia Aaron. We’d love your help. Let us know what’s wrong with this preview of Magnate by Celia Aaron. We’d love your help. Let us know what’s wrong with this preview of Counsellor by Celia Aaron. We’d love your help. Let us know what’s wrong with this preview of Of Mice and Murder by Steffanie Holmes. We’d love your help. Let us know what’s wrong with this preview of A Dead and Stormy Night by Steffanie Holmes. Damian wrote: "Thanks for the review of Sevara: Dawn of Hope, I really appreciate it! No problem. My husband and I were looking through your website last night and purchased the available graphic novels. Your artist is talented.